Where I have little to no patience for human beings (regardless of whether they be large or small), I have a decided soft spot for most of the other members of the animal kingdom. I’d rather spend a day with dogs, horses, turtles, or dolphins than I would 99.999999% of the people on the planet. After living with myself for 35 years, I suspect I’m uniquely unsuited for the role of parent by aptitude, attitude, and general level of interest. I don’t have human children and I’m completely at peace with that decision. Whatever nurturing instinct other people have for small humans, I seem to have for animals. Where most people in my age bracket are lavishing time and attention on their kids, for me it’s the dogs. Sir Winston, my medical misfit, will turn six in January. He’s my special needs child if there ever was one. With a host of ointments, salves, and balms for his skin, drops for his ears, a prescription diet, and a bionic leg, like me, he’s alive mostly because of the wonder of modern medicine. He’s well into middle age for a bulldog and seems to be happy enough passing his time sprawled out across the middle of the living room floor. He still has an occasional surge of the old energy that’s really something to see, but more and more he’s simply the grand old man of the house, content to watch the world pass by through the glass of the back door. Lady Margaret, the only chocolate in a litter of black labs, clearly follows in the footsteps of her older brother. By that I mean she is possibly the most atypical Labrador retriever I’ve ever met in my life. I won’t say that she’s lazy, but she is definitely laid back. Where other people complain that labs are overly excitable bundles of energy, she’s only really bothered when the doorbell rings or someone gets too close to her yard without seeking permission first. Maggie turns five in October, so it’s safe to say she’s well past the point where I need to worry about the rambunctious puppy stages. The two of them really have been nearly inseparable since the day I accidentally brought Maggie home. Aside from a few random days and the occasional vacation, they’ve both been pretty inseparable from me, too. They’re the closest thing to kids I ever plan on having… and they have the added benefit of never wanting to go to college, or get married, or borrow the car. Now if I could just come up with a way to claim them as dependents, I’ll be all set. This has been the final edition of “You Ask, I Write” for August. Thanks for playing. 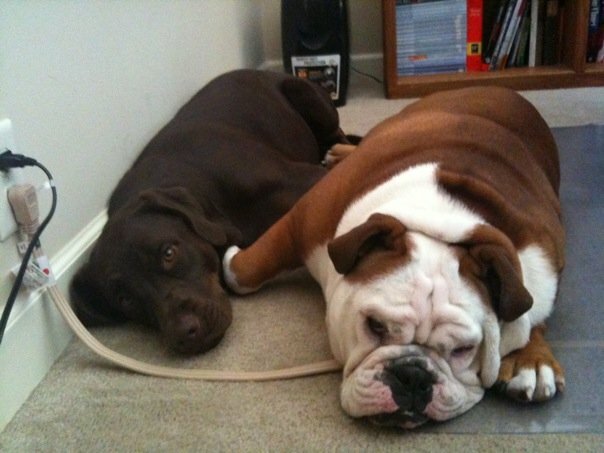 This entry was posted in Dogs and tagged animals, bulldog, Dog, kids, labrador, lazy, misanthropic, people, preference, vet. Bookmark the permalink.